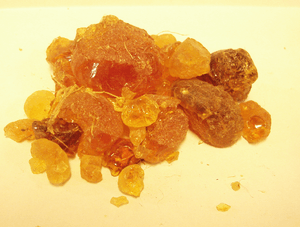 Gum arabic, also known as acacia gum, or meska, is a natural gum. It is made of hardened sap from two species of acacia tree; Senegalia (Acacia) senegal and Vachellia (Acacia) seyal. The gum is got from wild trees throughout the Sahel from Senegal to Somalia. In the past it has also been cultivated in Arabia and west Asia. Gum arabic is a complex mixture of glycoproteins and polysaccharides. It was historically the source of the sugars arabinose and ribose, both of which were first discovered and isolated from it. 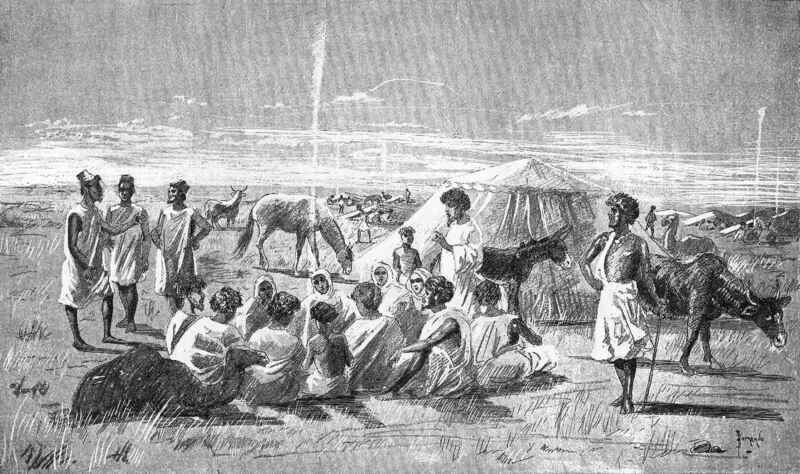 Acacia gum has been harvested in Arabia, Egypt, and west Asia since antiquity, and sub-Saharan acacia gum has a long history as a prized export. 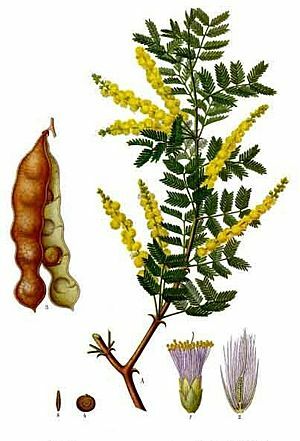 Traditionally harvested by semi-nomadic desert tribes on their travels, acacia gum is a main export of several African nations. The hardened gum is collected in the middle of the rainy season (harvesting usually begins in July), and exported at the start of the dry season (November). From the 1950s to the early 1990s Sudan did about 80% of gum arabic production. Today, the figure is under 50%. Hundreds of thousands of Sudanese are dependent on gum arabic for their livelihoods. It is still the world's largest single producer, and the production of gum arabic is heavily controlled by the Sudanese government. 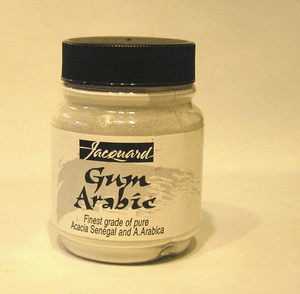 In food, gum arabic is used as a stabilizer. It is edible and has E number E414. Arab populations use the natural gum to make a chilled, sweetened, and flavored gelato-like dessert. Gum arabic has been used from ancient times as part of black ink. The main constituent is carbon soot from lamps or burnt plant material. Apart from water and gum arabic, the ancient Egyptian ink was made of not much else. Written on paper or papyrus, this ink has survived for over three thousand years. Gum arabic is a key ingredient in traditional lithography and is used in printing, paint production, glue, cosmetics and various industrial applications, including viscosity control in inks and in textile industries. Nowadays less expensive materials compete with it for many of these roles. Gum arabic is used as a binder for watercolor painting because it dissolves easily in water. 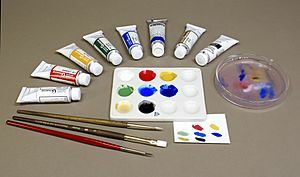 Pigment of any colour is suspended in the acacia gum to get in watercolor paint. Water acts as a vehicle to thin the watercolor paint and helps to transfer the paint to a surface such as paper. When all moisture evaporates, the acacia gum binds the pigment to the paper surface. After the water evaporates, the acacia gum in the paint film increases luminosity and helps prevent the colors from lightening. Gum arabic allows more precise control over washes, because it prevents them from flowing or bleeding beyond the brush stroke. In addition, acacia gum slows evaporation of water, giving slightly longer working time. The historical photography process used gum arabic mixed with ammonium or potassium dichromate and pigment to create a coloured photographic emulsion that becomes relatively insoluble in water upon exposure to ultraviolet light. In the final print, the acacia gum permanently binds the pigments onto the paper. Gum arabic Facts for Kids. Kiddle Encyclopedia.